What is a pack and play ? Parents realize the importance of having the right equipment for their newborns. When they wish to give the baby a safe and mobile space that is suited for playing and resting, pack and play is the first equipment which comes to mind. A pack and play is basically a handy device that you can pack up and carry along on trips. It is also known as a play yard. These are very convenient as they can also be converted into changing stations. They offer some pretty impressive features such as bassinet, entertainment or toy bar, and sounds. They come in several different sizes, styles, and colors. Whichever pack and play you choose for your baby, you will find it is an efficient equipment for keeping the baby entertained for long hours in a safe setting. The Evenflo Portable BabySuite Deluxe Playard is a highly portable play yard due to its lightweight. There is a bassinet insert with an extra clip on mobile. The play yard also features a changing table and a caddy for storage. Although the play yard is of light weight, it has a high strength. In fact, many customers claim to use it for children heavier than the rated maximum of 30 pounds. Since the play yard has two wheels on the frame, it is easy to move it around. Due to its low weight and its compact size when packed up, it can easily be carried from one location to another. However, despite its lightweight and compact size, the play yard is still not small enough when it is packed up so that it could be taken on a plane. Also, there have been complaints about the included mattress not being very comfortable. In case another mattress might eventually be needed, this may negatively influence the portability factor. The Graco Travel Lite Crib is considered as the best lightweight pack and play features a rocking seat that is removable and vibrating. The pack and play is 20% smaller in size than a traditional play yard. It can easily fit in the bedroom or anywhere else in the house. Since the play yard weights less than 20 pounds, it is super-lightweight and can be carried around conveniently. Despite being small and lightweight, the pack and play has a lot of features to offer. There is a canopy that shields the child from unwanted lights. The toy bar contains soft toys for the entertainment of the baby. The removable bassinet only adds to the convenience of this play yard. The signature Graco push-button fold makes packing possible within seconds and without any trouble. Airy mesh are found on all sides to provide good ventilation to the baby, thus ensuring comfort. However, this pack and play is more expensive than a full-size one. If you have a tight budget, this might not be your best option. Also, the mattress, not being waterproof, can prove to be troublesome. Nevertheless, a sheet can be used to compensate for this. Moreover, this play yard might be best suited for infants. Some customers complain that it is too small for their two-year old children. Lotus Travel Crib and Portable Baby Playard This play yard is a great and flexible option that can be used almost anywhere. Due to its lightweight, it is easy to transport it from one place to another. Setting up the play yard or putting it away takes less than one minute, thus making it a great option for traveling. Moreover, there are travel crib, fitted sheet, backpack and a mattress included. Since it can be converted to a backpack, the play yard can easily be taken on planes as carry on. However, unless there is a baby lying in the play yard, the ends of the mattress tend to not lie completely flat on the floor surface. Many customers also find the mattress to be too thin. Also, the initial use of the pack and play can be tedious as there are quite a few Velcro tabs which need set up. 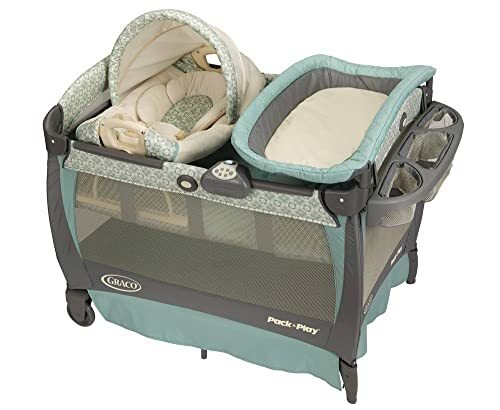 This Graco Pack ‘n Play Playard with Cuddle Cove Rocking Seat, Winslet is the best 3 in 1 pack and play comes with a cuddle cove rocking seat, in Winslet. There is a removable vibrating rocking seat that aids in bringing the child with you. Carrying handles are included to ease movement of the baby. These convenient carrying handles enable you to drag along the baby as you move across the house. This is quite a unique feature for baby rocking seats. Newborns, infants and toddler can all comfortably use this play yard. The gentle vibration in the rocking seat and the bassinet helps to keep the baby calm. The built-in vibration has a soothing effect on the baby. It is described as the calming feature of the play yard. The play yard also features a built-in changer to make diaper changes convenient. You can also keep the baby’s essential items close by. There are three cubbies in the pack and play to store diapers, clothes and wipes or any baby’s essentials. The rocking seat is equipped with fabric that can be machine washed. The fabrics are also soft and luxurious styled to cuddle the baby. However, customers complain about the music options of the play yard. A true white noise is not included. Not all babies respond well to jungle noises incorporated in the music selection. Also, the changing table did not prove to be very user friendly to many customers. The changing table sometimes experiences dipping such that it presses on the electronic buttons. This turns on the music. In fact, there are no legs on the other side to support the changing table. This Joovy Room Portable Playard can fit multiple children at the same time. It provides the perfect and safest meeting place for kids to have a good time. Also, the walls are mesh and large. Thus, the children can have a good view of their surroundings. The play yard offers a whole ten square feet of space that is safely padded and made of very high quality materials. In order to keep the structure intact, the steel frame uses aluminum tubing. This also helps keep the pack and play lightweight. However, the ten square feet space makes this play yard unsuitable for travelling. With such a large pack and play, it is difficult to carry it around or even move it from one place to another. Although it is probably the easiest pack and play on the market, it is best to purchase it for indoor use only. 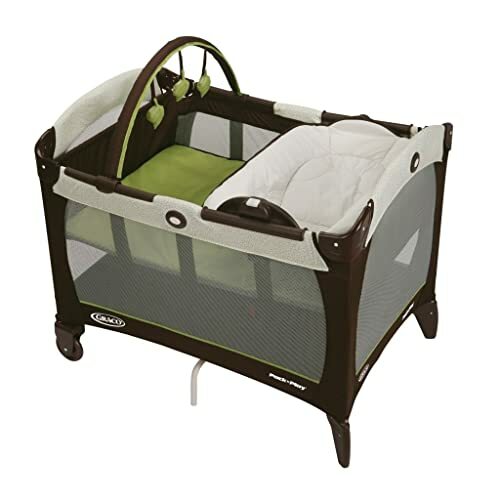 This Graco Day2Night Sleep System pack and play is ideally suited to improve the sleeping comfort of the baby. It is especially designed to be a baby sleep system that integrates baby sleep solution such that the child can have a comfortable, familiar and safe resting place. The play yard features a portable bassinet to carry the baby around the house. This cozy bassinet can dock right inside the play yard. There are also convenient carry handles for when the baby has to be moved throughout the house. The bassinet docks safely within the folding stand such that a baby sleep solution can be created anywhere. The play yard also features a flip away changer that is cushioned with wipe-clean fabrics. A storage compartment to keep the child’s essentials is also included. There is an MP3 speaker system and a two-speed vibration to keep the baby entertained. The micro fleece fabrics are soft to provide maximum sleeping comfort to the baby. However, some customers complain about the storage area being inaccessible while the changer is in use. This could be resolved by placing the changer above the bassinet area. Also, changing the lining to the bassinet might be troublesome if it gets soiled. This issue can be solved by ordering a second liner from Graco. It is called a replacement part. The Safety 1st Sweet Wonder Play Yard features a bassinet that provides comfort to the baby. The open-view breathable mesh ensures proper ventilation for the child. There is a changing station in the play yard. This changer is removable, as well as, wipeable. Thus, it is extremely easy to clean the changer. 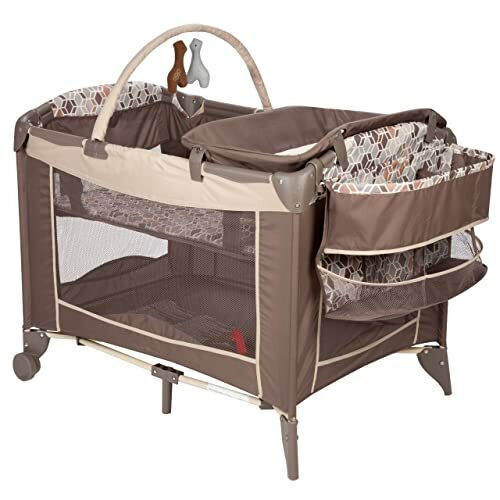 The pack and play is spacious and includes a toy arch with soft toys for the entertainment of the baby. There are safety indicators in the play yard. There is also a deluxe organizer such that the baby’s essentials are within your reach while using the changing table. For improved mobility, two wheels are present in the play yard. There is also a carry bag to facilitate travelling. However, parents complain about the toy arch being too high. The babies cannot reach it easily. Also, the diaper rack sometimes does not fit right and might fall. It is always best to be cautious about this. 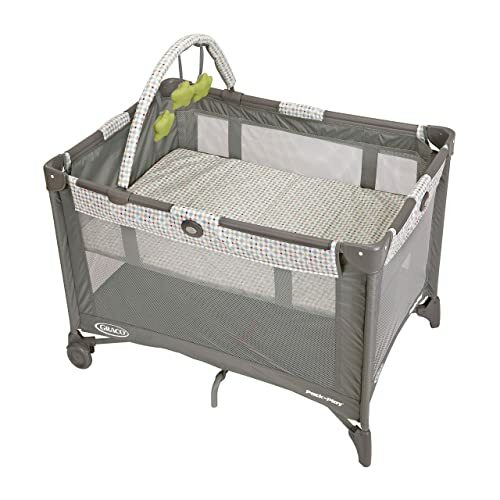 This Graco Pack ‘N Play Playard with Reversible Napper and Changer is best for infants who are less than 35” tall. They will not be able to climb out as well. 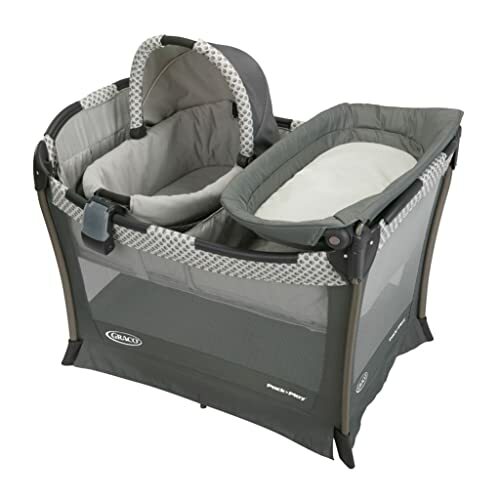 The pack and play is especially designed for babies whose weights are less than 15 pounds. The changer as well is appropriate for babies of the same weight range. The napper that comes in the play yard is ideally for babies under 3 months such that they are not able to roll over. There is also a bassinet in this pack and play. Again, it has been designed with babies weighing less than 15 pounds in mind. The secure switch that is found in this play yard makes it easy and convenient to switch from changer to napper and vice versa through a simple push and lift mechanism. Parents do not have to worry as the attachment is sturdy and secure such that it is safe to do the switching between napper and changer. The removable toy bar includes soft toys to keep the baby entertained. Airy mesh on all sides ensures proper ventilation for your child. However, customers complain that the play yard does not fit in the travel bag when it is folded. Also, the changing pad has a low height, thus impeding movement while changing the baby. Moreover, the price of the pack and play is slightly higher than the ones you would normally find for infants. 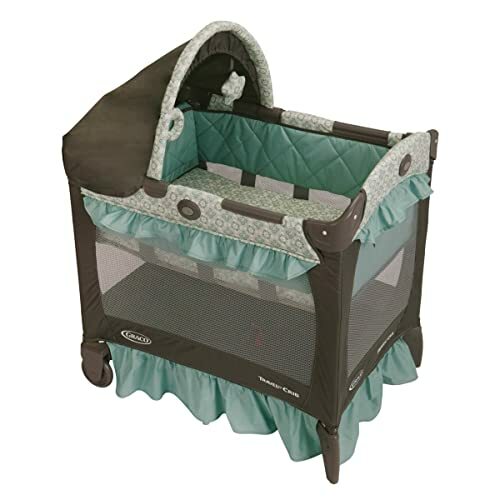 This highly affordable Graco Pack ‘n Play Playard features automatic folding feet and wheels. This allows for a very compact fold, thus making it ideal for storage in a limited space and for travel purposes. 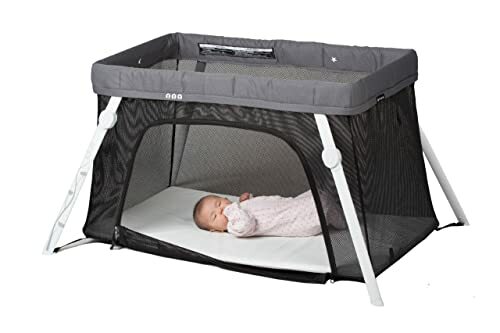 Despite the low price, the pack and play has a durable frame that again makes it suitable for travel without incurring any damage. The bassinet is an added feature which contributes to the overall user friendliness of the play yard. The signature Graco push-button makes it hassle-free to break the pack and play down and assemble within seconds. Although the play yard is very affordable, you can rest assured that your baby will be comfortable. However, it would be wise to immediately check the play yard once you receive it. A customer complained about the play yard not reaching the lower frame. This is unsafe for the safe. Another customer reported that the little pouch on the side was missing. There was also a hole in the fabric. In such cases, it is best to return the product and have another one delivered to you. One would normally choose the basic play yard to take it on the go. This is due to its lightweight and mesh design on all sides. Also, due to the lack of various features, it is easily carried around. So, if you travel a lot and have to take the baby with you, a basic play yard would be a good choice. It will provide a cozy and safe place for the newborn, irrespective of where you are. The basic models also come in a travel bag for increased portability. For a more high-end play yard with additional features, the deluxe play yard would be suitable. This, of course, means you need to spend more as well. It usually comes with a removable changing table. There is also an organizer for holding diapers and a bassinet. The deluxe version can also offer vibrating mattress, electronic mobile, canopy, music and nightlight, provided you find the right one. Due to these features, the weight of the deluxe play yard is more than that of a basic model. 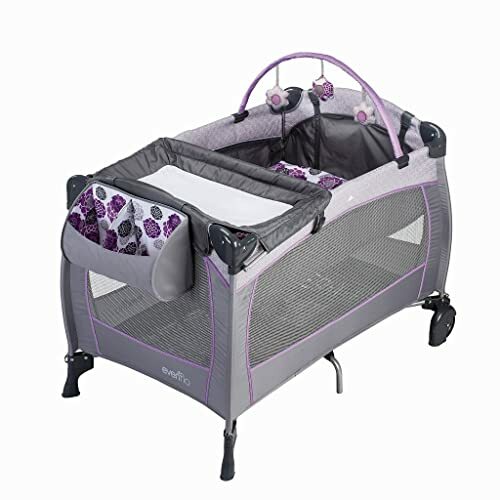 There are numerous pack and plays that come with a bassinet which covers the entire length and width of the equipment. The chances of your baby falling into the play yard are thus considerably reduced. However, it is worth keeping in mind that you should leave your baby unattended while these devices are in the yard. If the child moves around in the bassinet, he can fall out and suffer from injuries. Having a removable changing station in your pack and play is very convenient. In some models, the changing station rests on the long rails. Therefore, it can be flipped easily to hang at the outer side of the play area. Being able to remove the changing station makes sure it is out of reach of the child. Make sure to choose the play yard with lockable wheels. This will still enable you to move the equipment around, but it ensures that your baby is safe. Some models can roll even when they are folded. It is thus easy to carry it out even in a folded state. A pack and play with a canopy offers several benefits. The canopy covers the bassinet. It shields the baby from any harsh light. Some canopies even have toys attached for the baby’s entertainment. However, you must remove the canopy when the bassinet is not being used. Some pack and plays have zippered side pockets, clip-on bags and hook-on pouches to provide storage space for toys and baby’s essentials. Although this feature is not essential, it is still very convenient to have everything handy. Nevertheless, you should ensure that the storage pockets are connected to the outside of the play area and are not within the baby’s reach. Even babies get bored. But the right play yard takes care of that. Some pack and plays have a toy bar that holds soft toys for the baby. Some even have a detachable baby gym. This can be used along with the bassinet mattress on the floor. There are entertainment centers where music can be played or soothing sounds and lights can be used to entertain the child. Mesh sidings are the best materials for the sides of play yards. These provide better ventilation within the pack and play. Also, they are semi-transparent. It is, therefore, easier for you tokeep an eye over your child. Mesh sidings are also easier to clean than fabric sidings. However, it is always safe to choose play yards that have tightly-woven mesh sidings. Only ensure the holes are only about one-quarter inch large. This prevents the baby from inserting his fingers, toes or clothes in them. You should definitely consider your baby’s weight when purchasing a pack and play. For play yards without a weight limit, you should look for the ones that come in the form of walls that set up on the ground. However, a floor is integrated in most designs and there is a rated maximum of weight which it can support. It is also worth knowing that the bassinet or changing station can support less weight than the principal play yard. The bassinet mattress is usually very soft to provide as much comfortability as possible to the baby. The inside of the play yard is also roomy enough for the baby to not feel stuck. You can be sure your baby is safe even if you are not paying continuous attention. Pack and plays are designed to provide maximum safety to the child, while you are running your errands or doing things around the house. It is extremely easy to build the play yard. It can also be conveniently packed up for travel. The storage space required is not much either due to the generally easy fold of pack and plays. Due to the numerous models and brands of pack and plays available on the market, each company tries to offer the best deal. Thus, you can purchase play yards at a rather affordable price. 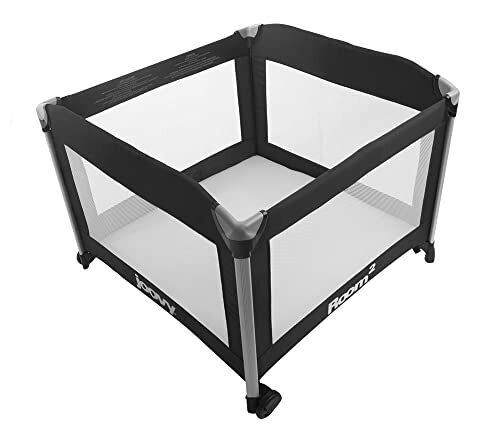 Lightweight is an in-built feature in almost every pack and play and they can fold upward easily. You can now carry your baby with you on every trip. Use the travel bag for the play yard to store it conveniently. Some deluxe models come with fun, yet educational, toys and accessories. These can be used by the baby to play and learn at the same time. In fact, playing can help in developing the key motor skills right from a very young age. A play yard is a safe place for the baby to sleep or have a nap. When traveling or visiting relatives, it is a good place for the child to rest. Since most pack and plays come with changing stations, you can even change the baby’s diapers. The bassinet also serves several functions. A pack and play ensures that your baby is close to you even when you are busy running errands or doing chores in the house. You can easily roll the play yard from one room to another and keep an eye on the baby. It is the safest way for your baby to be confined to one space when you cannot give him your full attention. With the numerous models and brands on the market, one can easily get confused and end up picking the wrong play yard. By using this guide, you know exactly which features to look for in your next pack and play. You also know about which benefits you should be on the lookout for. To make your search less tedious and frustration, seven top pack and plays have been picked and analyzed. With a little homework on these five play yards, you should be looking no further. Their various features match our list of criteria perfectly. Make sure to keep your child’s needs into consideration when making your choice of pack and play. In any way, the baby should be the happiest.